New York – Since the last meeting of the Organization of Petroleum Exporting Countries on Dec. 4, the market has been extremely sensitive to the pressure of reported low oil prices comparable to the 2008 financial crisis, in spite of a slight price lift off of 1.9 percent which erased early loses on today’s session. Moreover, the logical impact on global growth of oil declining prices has not been as high as expected since it accounts for maybe 0.5 percent of global GDP, as Kenneth Rogoff from Project Syndicate reported. This month we have seen reactions from different angles of this issue, all of which relate to oil market volatility, government expenditures, war financing strategies, and emerging markets adjustments fuelled by the seeming structural changes of oil economics. Each player is aware that the oil exporter group, led by Saudi Arabia is determined to “maximize low-cost OPEC supply and drive out high-cost non-OPEC production – regardless of price,” as the IEA reported. ISIS, Russia and the frackers of the United States are the main targets of this pivotal move. Today, the price of oil slid to $34.53 per barrel – so far and yet so near the crisis low of $32.40 a barrel that was set in December 2008. This blow came since Iran’s production is expected to surge after the nuclear sanctions imposed by the West are lifted early next year. Since June 2014 when the price of this commodity collapsed from $115 per barrel to $45 on November 2015, both producers and consumers – specifically Venezuela, Russia, Nigeria, China and India – had been lobbying and looking closely to the OPEC meetings, expecting to see if the cartel agrees on a production ceiling that would stop the free fall of prices – or not. OPEC negotiations did not end with the expected result for some producers; in turn production has remained at some 31.5 million barrels per day. This month alone, oil has lost 14 percent of its value giving the markets a hint of the extent of this price war, mainly between the US and Saudi Arabia for their market share. Markets are foreseeing that this game would be joined by Iran, who is not delaying its plan to boost oil shipments despite current prices, as Amir Hosseein Zamaninia, Iran’s deputy oil minister for international and commerce affairs, told Bloomberg. The result of this new dynamic might lead to a $20 barrel, as Goldman Sachs Group Inc. has warned for months and Venezuela’s Energy Minister Eulogio Del Pino told reporters after OPEC’s meeting in Vienna. The International Energy Agency is doubtful about the strength of oil demand on 2016. Developed countries’ adviser on energy expects demand to fall behind 1.20m bpd next year, while the OPEC forecasted it would be on 1.25m bpd to average 94.14 million barrels a day next year, upping its forecast mainly as a result of “better-than-expected consumption in Europe and Other Asia”. In this sense, its important to count in the seasonal demand for heating oil which has subside given that temperatures in the U.S and Europe have been moderate, letting countries to accumulate higher than normal inventories of refined products, slowing demand much more, as reported by Nasdaq. “We hope an increase in oil-market demand, on one hand, and a dropping trend in production or drop in the increase in production, as seen and said by non-OPEC producers, will exert less pressure on prices,” Iranian Oil Minister Bijan Namdar Zanganeh said, according to a report on Sunday by IRINN state TV. The biggest consumers in the game are China and India, which have benefited from these low prices as motorists in those countries – and also in the U.S – have been filling up their tanks for less money. But as we said before both Asian countries are looking close to OPEC meetings because sustained low prices don’t mean that there are going to be benefits in the long run for crude importers. More consumption driven by low prices means that the transition to a low carbon economy could be more difficult, and we should remember that last week 196 countries reached an agreement to address the climate change issue. Emerging market energy importers’ environmental impact is higher today than it was 30 years ago, so they have a more interventionist policy than developed countries, according to Rogoff. The slowing growth of China has dampened all commodity prices, given that the country is rebalancing its domestic consumption. Moreover, government financed subsidies to keep prices low for consumers have put both countries to cut back massive costs by seizing this opportunity to reduce fiscal expenditures. Iran has said it will put 500,000 barrels per day more to its output when the sanctions are lifted. 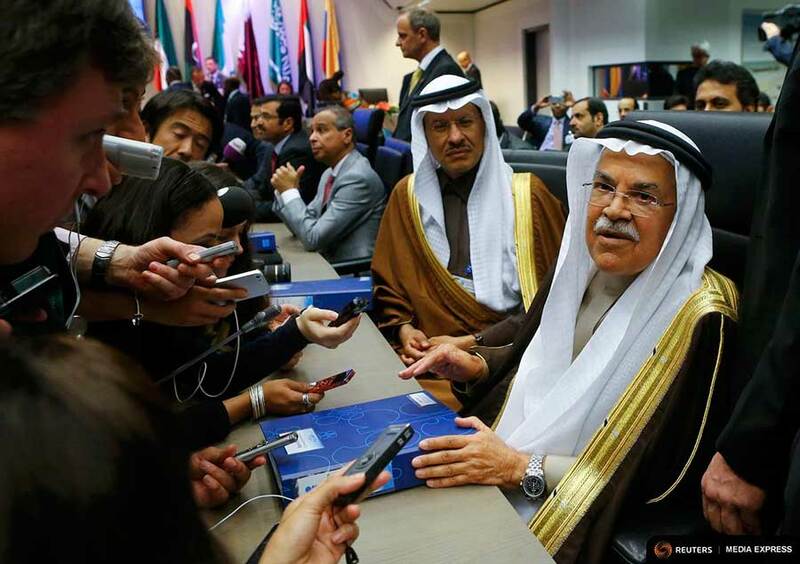 Saudi Arabia as we said before, is expecting this to be a real force inside OPEC’s discussions in the future. Venezuela, Nigeria and Russia are expecting lower prices next year but not for their pleasure given that governance in those countries is somewhat depending on the spending those governments are able to deliver. To make it clear, the front-runner of this price situation is the oversupplied market, led by Saudi Arabia and the US. In this sense, traders, money managers and hedge funds have bet on lower prices for six straight sessions, and it is expected that in recent weeks prices could fall even more, according to the Commodity Futures Trading Commission. According to the IEA the Saudi strategy is evidently working, as non-OPEC suppliers are going out of business, with annual supply growth going below 0.3m bpd in November from 2.2m bpd at the start of the year. There is also a decline expected in 2016 as US light tight oil is contracting. In the long term this price war will put more and more pressure on energy companies that at this time are seeing their debts and operations demanding more and more money. The Arabian kingdom reached a record outoput of 10.48m bpd in June, and pumped 10.33m bpd last month, as data by Bloomberg shows. 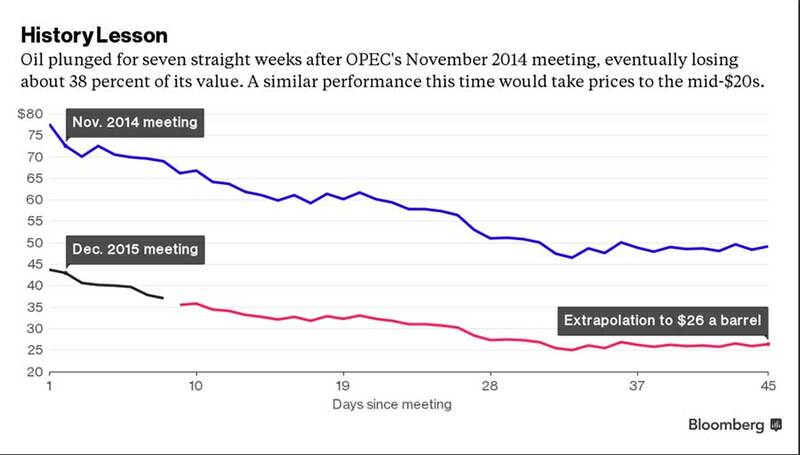 Budgets for oil explorations on non-OPEC countries are shrinking, as investors don’t see the prices going up. Chevron Corp. said it will spend 24 percent less capital next year and ConocoPhillips would do the same. Declining spending is one of the possibilities available to set up conditions for prices rebound, according to Dan Heckman, senior fixed-income strategist in Kansas City, Missouri, at U.S. Bank Wealth Management, which oversees about $126 billion.